On this lovely summer day, I went to the Elephant Walk for lunch with my dear friend, Fart. My boss always raves about this place, so I figured it would be awesome. The interior is definitely not what I thought it would be. It was a lot more "casual" than I had expected. In any case, I was keen on reading the menu options as the restaurant's specialties were Cambodian & French cuisines infused. I ordered"Crevettes Amrita" which wasa shrimp curry dish. It was such a typical "Sumaira" dish. 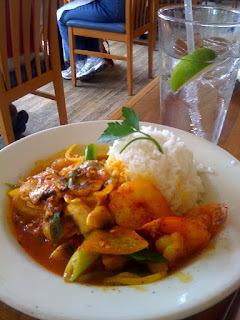 I imaginethe dish incorporated more of the Cambodian style than French - there was a perfect amount of salt and spices. Fart on the other hand ordered something not so delicious. Not sure of the dish's proper name but Fart ordered cod with cheese and tomatoes. Not an expert on French food but I am assuming that this dish incorporated more of the French cuisine. Not so yummy.